In the original release of Building Web Apps with WordPress, our chapter on localization included a section on localizing non-string assets. At the time, it seemed appropriate to include this information in case you needed to swap out images, text files, or html templates based on the chosen language. However, in practice, we almost never need to do this on the apps we’re building nowadays. Images rarely include text or other material to be translated. Instead of a folder full of .html files, templates are more often full on .php files or reference strings declared in other php files. Modern WordPress programming, even on the design side, expects a multidisciplined developer capable of editing .php files full of localized strings. Further, our use of load_textdomain() over load_plugin_textdomain() and load_theme_textdomain() confused other plugins and tools that expect all properly localized plugins and themes to use one of those variants. The custom code we came up with to load the text domain with support for an assets folder turn out to be too clever. We’ve decided to remove the section on localizing non-string assets from the second revision of the book. While localizing non-string assets hasn’t become as common a requirement as we once thought, the code and information below might be useful to developers who need to load the text domain in a similar way. Tom McFarlin has been maintaining an awesome WordPress Plugin Boilerplate for some time now. It’s a really good start for plugins that need a bit more structure to them and has things organized in a similar way to what we recommend in the book. Tom just posted an update on the boilerplate on his blog and is asking for others to get involved. To that end, we need help testing and reviewing the current version of the plugin. So if you’re a WordPress plugin developer who is familiar with the WordPress Coding Standards, the Documentation Standards, and who prefers an object-oriented approach to plugin development, then please check out the develop branch on GitHub. Frontend frameworks are useful collections of code and assets that speed up and standardize the development of the frontend of your web apps. Two popular frontend frameworks are Bootstrap and Foundation. In the book, we offer an example of how you would include Boostrap into your WordPress theme. Here is similar code to use Foundation in your theme. First, download the Foundation library from their website and place it into a /foundation/ folder in your theme. Then add the following code to the functions.php of your theme. This will get the Foundation code and assets loaded into your theme. From here, you’ll have to follow their docs for how to actually start using their grid, CSS classes, and widgets in your theme. I’m going to talking at the Philly Burbs Meetup tonight. If you are anywhere near Phoenixville, PA you should come. If you are anywhere near the Philly suburbs, you should join the burbs meetup group. What am I going to be talking about? 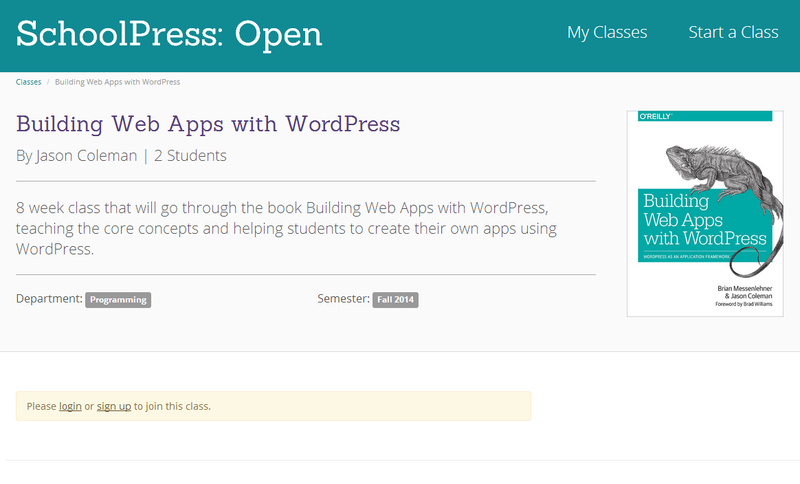 Building Web Apps with WordPress of course! I’m going to use this blog post to organize my notes. You are already using WordPress. Launch a minimal viable product (MVP) early. One pager to announce product. Paid Memberships Pro to GET PAID. Build app into site, instant users. AppPresser for native mobile apps. People talk about scaling too early. Throwing money at hardware is okay. See the site in action at schoolpress.me. See the source code and docs on GitHub. The site is in beta and will have issues. Point them out for me in the issue tracker in GitHub and help us work on them. Please only post true classes you intend to run at open.schoolpress.me. If you are just testing, use testschool.schoolpress.me. To deter spam, new classes won’t show up on the homepage or in the browse/search immediately. I have to enable this per class by hand. I may charge a small fee for open classes at some point in the future as well depending on what kind of spam bots we run into. There are some obvious things that need to be completed (the code around submissions for assignments from the book for one), but remember that this isn’t an active project for me (yet anyway). It’s a demo we imagined up to showcase some of the ideas from the book. There is a lot going on and some really cool learning opportunities in the existing code and in the code that can be done going forward. I’m planning on blogging about the process on the site here. The class I posted on the site is real. Sign up now. I may have to close signups at some point, but it is open for now and completely free. Starting in September, we’ll be tackling a couple chapters of BWAWWP each week, using the SchoolPress app as an example. Many readers of the book wish that BWAWWP was more of a step by step “how to build a WordPress app” book. We didn’t want to write the book that way, but I do believe that this class and some of the stuff that will come out of it will fill that need for people who are looking for that kind of experience. When we started writing the book, we thought up SchoolPress as an example app that we could use to help make the examples more concrete. We always intended on building the SchoolPress site, running it, and sharing the source code from it. As we got into the writing of the book we learned (1) that writing a book takes a lot of time and (2) an example from SchoolPress wasn’t always the best way to explain a concept. We ended up picking our examples based on what would help explain the topics we were writing about rather than having every example based on SchoolPress. And so we didn’t need a fully functional SchoolPress to finish writing the book, and we focused our time on the book itself. We still had time to finish SchoolPress up before the books release, but didn’t hit that deadline obviously. Both Brian and I have small children, run startup companies, have many side projects, and generally are busier than we should be. Excuses out of the way, I’m really sorry that we didn’t get SchoolPress launched earlier. I was honestly a little surprised in the interest in SchoolPress (how about the 450 page book? ), but have come to respect why people want to and need to see that site to better appreciate the book. Like any good project, SchoolPress was released behind schedule but still earlier than I am comfortable with. There is work to do to make it a good application and also general framework for building SchoolPress like sites. As I work through the project and share the challenges and interesting bits of development that come up, I’m sure I’ll have lots of great content to share here for people interested in building web apps with WordPress. Found Art is a series where we take real code from the wild (usually from open source projects) and use it to demonstrate different programming techniques in WordPress. Chapter 10 of Building Web Apps with WordPress is all about the built in XMLRPC API for WordPress. We didn’t have time to get to it in the book, but WordPress makes it very easy to add your own methods to be called through the XMLRPC API. A good example of this are the methods added by Paid Memberships Pro which allow API users to query for the membership level for a particular user and also to test if a user has access to a particular post. These calls have been used to develop single sign on solutions between a PMPro-powered WordPress site and other non-WordPress apps. All of this code can be found in the /includes/xmlrpc.php file of the Paid Memberships Pro plugin. I’ve also broken out the code into sections so you can browse it here. First, we add our methods to the WordPress XMLRPC API. Each method points to a callback function to handle it. Then we write the callback function for the pmpro.getMembershipLevelForUser method call. * API method to get the membership level info for a user. // Default to logged in user if no user_id is given. And finally, the callback function for the pmpro.hasMembershipAccess method call. * API method to check if a user has access to a certain post. Notice that each callback function has a single parameter $args passed into it, which is an array of all of the arguments passed to the method via the XMLRPC call. The first two arguments will always be the username and password being used to access the API. The other parameters will come after. You should document and expect the arguments to be passed into the method in a certain order. In the pmpro.getMembershipLevelForUser method, the 3rd ($args) parameter is the ID of the user to get a membership level for. The actually callback function pmpro_xmlrpc_getMembershipLevelForUser() simply checks that the user calling is an admin or has the pmpro_xmlrpc capability and then passes the 3rd user_id parameter to the pmpro_getMembershipLevelForUser() function and returns the result, which is going to be serialized and delivered via the API. In this case, the pmpro_getMembershipLevelForUser() will return false for non-members and an object containing the membership level data for members. With this API in place, you can make a call to the method using code like this in a WordPress app. If you place this code into a custom plugin or your theme’s functions.php file, it will load the XMLRPC class bundled with WordPress and make a call to a remote site where Paid Memberships Pro is activated and the PMPro methods are available. To test this out, make sure you update the remote url, username, password, and remote_user_id in the sample code and then navigate to “/?test=1” on the site you installed the code on. Notice that this is just a test. In the real world, this code would be part of a larger plugin or app and you would obviously do something with the level data returned instead of just halting output. I hope this shows how easy it is to add your own API methods to WordPress. I know I was very surprised at how quickly I was able to add the method to Paid Memberships Pro when I finally got down to it. If you want to see more examples like this, with great explanation of the inner workings of WordPress, be sure to pick up our book Building Web Apps with WordPress. I just published our hosting recommendations. It covers SiteGround, Web Synthesis, 1and1, and Firehost, all of which are great hosts depending on your needs and budget. We’ve worked with other hosts that are excellent, and may update this list over time. See the full recommendations list here. Building Web Apps with WordPress Available Now! The book is out! You can pick up the Kindle version now. I’m told the printed book will be shipping out around May 5th. So make your orders now. If you are interested in what kind of content is covered in the book, take a look at the table of contents. Jason was on WPwatercooler again. Summary. The WPwatercooler is a great show, and I was on it again this past Monday with my BWAwWP co-author Brian Messenlehner. I may make it a habit to get on that show. And I may make it a habit to follow up each show with a summary of what went down. The show topic was How do I make sure I don’t have to re-do my website just months after it’s done? Make sure you are using a good developer. Good developers will do things “the WordPress way” (e.g. using hooks and filters instead of hacking plugins), which will be less likely to be broken by plugin and core updates. Make sure you are using a good designer. Good designers will simplify things and use proven methods that are less likely to be broken by software and browser updates. Make sure your website has a purpose other than looking pretty. One year after your website goes live, it will probably be out of style… at least a little bit. But if you built a website that encourages people to call your sales phone number, it will still do that no matter what the design trends are. Make sure you have a maintenance plan. In addition to having someone on call to perform WordPress upgrades, have a developer on retainer or on call to fix things if anything goes wrong. We need to do a better job of communicating with our clients about what role maintenance will play in their website. There were a few analogies thrown around on the show (websites are like babies?). My favorite was to think about your website like a car bought on lease (get regular oil changes and be ready to trade it in every 2-3 years) instead of a used car you buy and run into the ground. It’s a cool little piece of functionality that will help out developers building asynchronous apps on top of WordPress. At first, I didn’t see the need for it. (It’s not too hard for developers to create their own script to poll the server every few seconds.) But I soon realized why an API like this would be useful. If you have 5 different plugins all with their own server polling, you are going to have 5 different hits to your server every 15 seconds. However, if they all piggyback on the Heartbeat API, those polling requests are going to be bundled so you are only hitting your server 1 time every 15 seconds. There are other benefits, but that’s the big one to me. Let me know if you have any questions about the API and I’ll try to address them. Description: Minimal example demonstrating the WordPress Heartbeat API being added in WP version 3.6. //Add your conditionals here so this runs on the pages you want, e.g. This hooks into the heartbeat_received filter. It checks for a key 'client' in the data array. If it is set to 'marco', a key 'server' is set to 'polo' in the response array. © 2019 Building Web Apps with WordPress. All Rights Reserved.